For my regular readers, I want to apologize for missing day four of the new series. Sometimes life just gets in the way. The next letter in our Alphabet Soup of Success is D. As I prepared, there were a plethora of words beginning with D that vied for my attention. I promised you that D was for DARE, but the whole topic of being successful today is not just being daring, but also differentiating. One of my favorite inspirations is Gaping Void and their cartoon of the day yesterday was about creating new things (click on the image to order an art print). 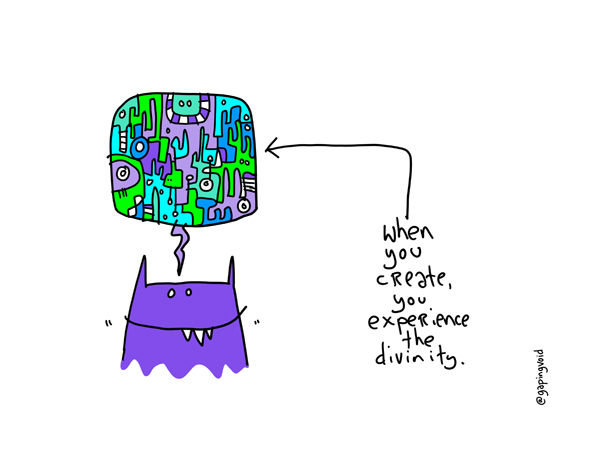 The purple cat in this illustration was experiencing divinity through creation of the amazing piece of art that is his thought bubble. That is what happens. When we create, we tap into divinity, that force within us that was instilled by our own creator. No doubt about it. To succeed you have to stand out from the crowd. No one gets ahead with a commodity product. Oh, you can for a little bit. But it is simply not sustainable. And no one achieves divinity by taking incremental steps forward. Back in 2011 I did a syndicated study that looked at the mode of transportation used for travel in the US. I published a white paper called Dare to Differentiate. To be honest, I named it that because I was hoping that the old guard in my industry would be up for a dare. You see the global distribution systems (Amadeus, Sabre, Travelport) and online travel agencies are totally focused on the air traveler, when here in the US, the air traveler only represents 11% of all leisure travel in this country. Even for business travel, just 33% travel by air. But they didn't take the dare. They are still stuck focusing on the status quo, moving ahead incrementally, with precious little true inspiration in anything that they release. Any innovation is happening only in small niches, the sharing economy and vacation home rental to mention a few. What does being daring look like? It means being audaciously bold. Stepping away from the status quo and truly differentiating. You must step back from existing processes and see what it is that you are requiring of the customer in order for them to use your product. When you make things simple for the customer, that is where the divinity lies. So today instead of getting two for the price of one D today, you are got three. Dare, Differentiate, Divinity. Stay tuned. Yes, you guessed it, E is for EASY.